Seated is Virginia Governor Mark Warner. At far left is Fred Kern, President of The Virginia Crime Stoppers Association. 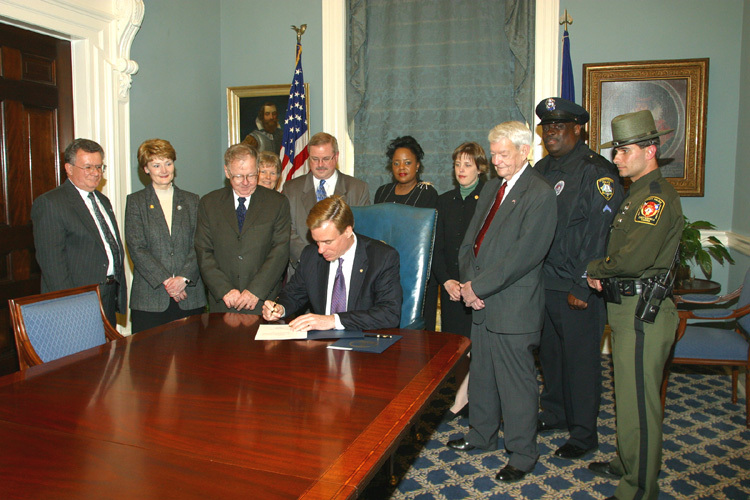 In the center behind Governor Warner is Marc Woolverton, retired from the Manassas City Police Department and a member of the Manassas Crime Solvers. At far right is Master Detective Kevin Bacon from the Chesterfield County Police Department and coordinator for the Chesterfield County/Colonial Heights Crime Solvers. She is on the Board of Directors of the Friends of the Robeson County Public Library. While living in Virginia, p.m.terrell was a strong supporter of The Virginia Crime Stoppers Association and its affiliated Crime Solvers, Crime Stoppers, and Crime Lines. She was with then-Virginia Governor Mark Warner when he signed into legislation additional protection for citizens calling Crime Solvers and Crime Stoppers with tips. It ensures that citizens will remain anonymous and can not be called to testify in court. She served as the first female President for the Chesterfield County/Colonial Heights Crime Solvers. And she served as Treasurer for the Virginia Crime Stoppers Association.